The location was perfect and above a car/bike rental. The view of the port was outstanding and you could take your breakfast to your room on a tray and eat on your balcony. It is a few minutes on foot to the ferries, beaches, museums, ancient settlement with column and boats to outer islands. We would probably stay again but be sure to get a room with balcony in the front. Great value. At the heart of the port, perfect location, very friendly staff, everyone was always there ready to help us. The position was amazing. Sitting on the balcony in the morning having breakfast and watching the actives at the marina and in the evening having a drink watching the world go by. Helen was particularly friendly and very obliging. We hired a car from Costa at the hotel and it was easy. Easy accessible, when arriving with a ferry you'll see the hotel right away. You take your breakfast to the balcony of your room and enjoy it with a great view. There is a fresh cold water tank you can use all day. Breakfast was excellent. Location good. Staff very friendly. Rooms serviced daily. Good value overall. I have been before many times in Aegina to other hotels but hotel Togias is something different!! What a view...Breathless!! You see in front of your eyes the Saronic gulf.Near to the sea and beaxhes, opposite to the port, exactly to city center!! Very nice people,pleasure accomodation and nice and delicious breakfast with a lot of variety! When I come back hotel Togias is my first priority. The room was small but adequate for one people. The bathroom was very tiny. The room was clean and comfortable. Breakfast was served on the second floors hallway and you had to eat it on your balcony. The location is good in the center of the town but if you are a light sleeper it may be uncomfortable for you because of the traffic noise. The personnel was friendly and very helpful! Nice and new hotel in the center of Aigina, next to the port. i think the better choise to discover the island. The breakfast was English with many local taste things. Wi-fi has available to all the hotel. The room was clean and the bed very comfort. I recommend it for next visit! 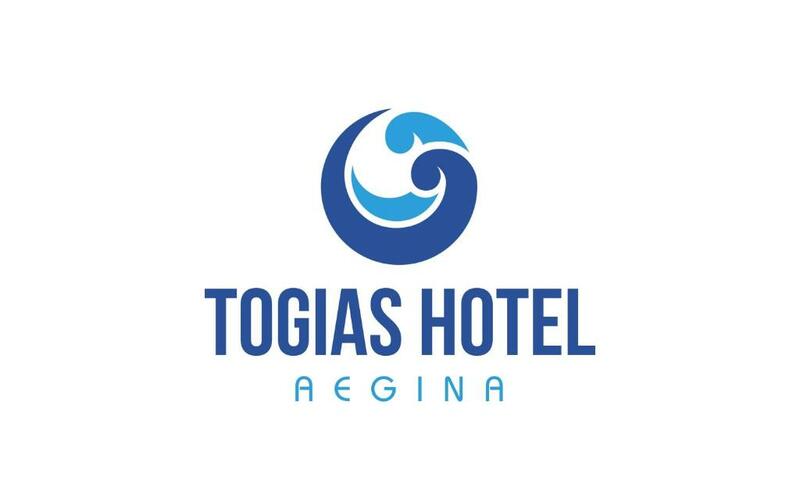 Togias Hotel This rating is a reflection of how the property compares to the industry standard when it comes to price, facilities and services available. It's based on a self-evaluation by the property. Use this rating to help choose your stay! 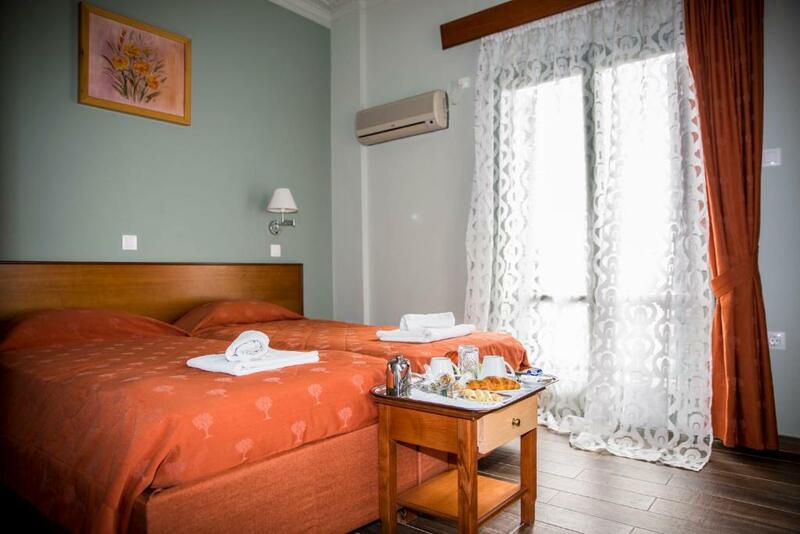 Featuring a restaurant with Greek and Mediterranean flavors, Hotel Togias is located in the picturesque Aegina Town, just 150 feet from Avra sandy beach. 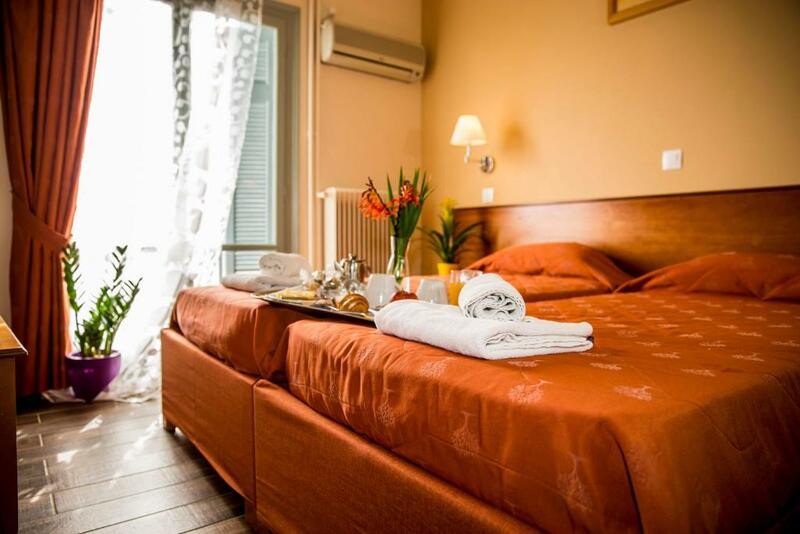 Its air-conditioned accommodations comes with a private balcony overlooking the Saronic Gulf. Fitted with tiled or marble floor, the simply furnished rooms of Togias are equipped with a TV and a fridge. 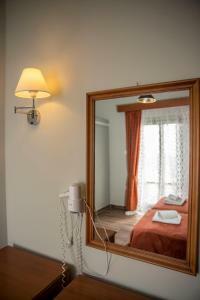 Each unit includes a private bathroom with shower and free toiletries. 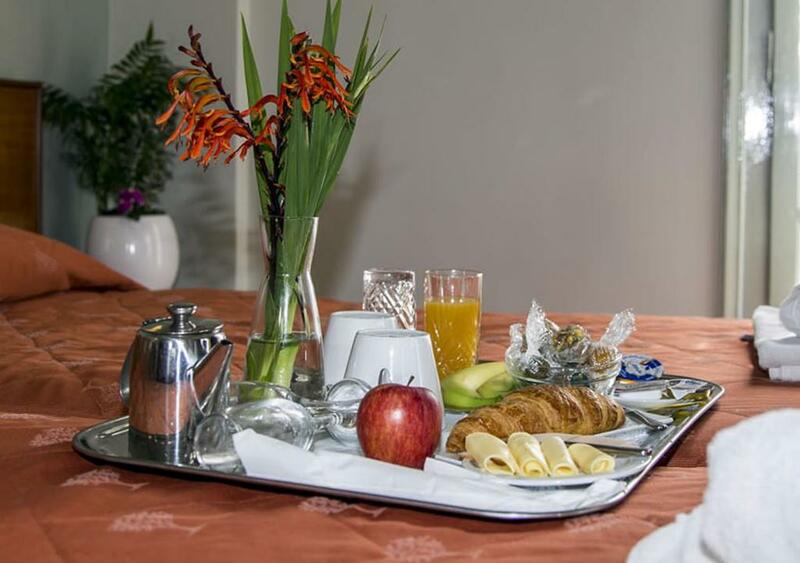 Guests can start their day with a continental breakfast served daily at the dining room. A variety of dishes can also be enjoyed at the on-site restaurant for lunch or dinner. Within a short walk, guests will find restaurants, bars and shops. Hotel Togias is located 2,300 feet from Aegina Port and 7.5 mi from the famous Temple of Aphaea. Agia Marina Village with its sandy beach is at 7.5 mi, while the sandy and pebbled beach of Souvala is 5.6 mi away. Free public parking can be found nearby. 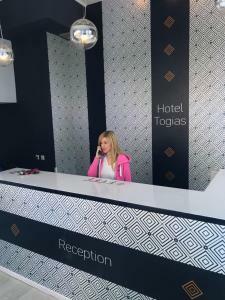 When would you like to stay at Togias Hotel? Overlooking the Saronic Gulf from its furnished balcony, this air-conditioned room is just 1312 feet from the sandy beach. A fridge and a TV are featured. At Togias Hotel every room is unique in it’s own way. 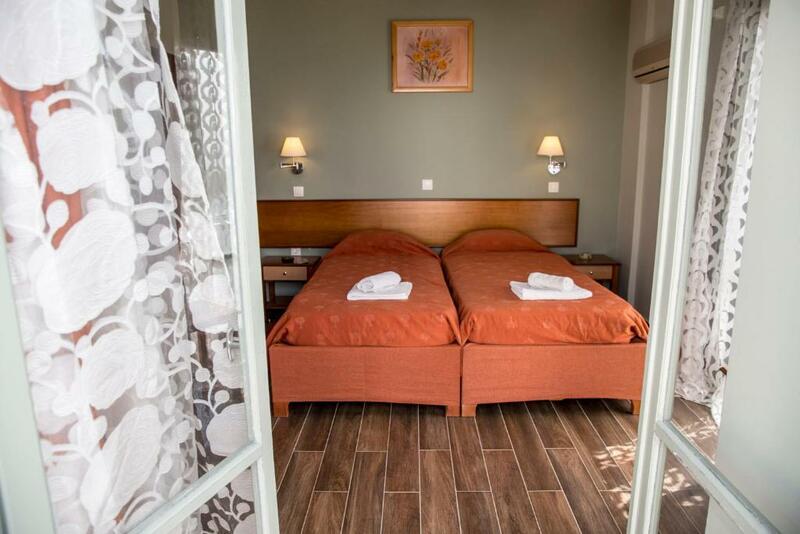 Colorful and fully equipped, our rooms are ready to serve your needs and make your vacations in Aegina more pleasant. Togias Hotel is is close to everything you need to see during in Aegina. Togias Hotel is located in the town center of Aegina Island in Greece. It has 11 double bedded fully equipped rooms with an optional additional bed (on request) for kids and guests. Togias Hotel boasts the most ideal location in Aegina town overlooking the vivid pace of the Port and the sparkling colors of the sea. Nestled in one of the most romantic landscapes in Greece this seaside retreat offers the most magical Aegina town view with flickering lights illuminating the town of Aegina. House Rules Togias Hotel takes special requests – add in the next step! The Internet didn't work on the 3rd floor. One had to go down to the 1st floor or lobby to get a connection. The bathroom handle kept falling off. The guy at the reception was not very friendly (the woman however we met next day is very friendly). The beds are really hard and the room was not very clean. The breakfast is ok for a few days but there is no variation so it will get boring quickly. We had booked a room with a balcony and had to take a very small room with only a window the first two nights due to a mix up. Also we had to pay cash as the card machine wasn't working. Eleni was extremely nice and apologetic and we were charged a lower rate for a larger room with balcony the second two nights. Also the internet was spotty. The bed was a little small and hard. Huge internet problem. It kept getting switched off & I had urgent work to do -and I had to write a note not to unplug the router but every time I was told it was a "problem on the island"- this was not true, just a problem at that hotel. Disappointed we didn't have a front room balcony view as requested this on booking. Not a lot,! WiFi in the room could be better but it was readily available in the reception area if one needed it. There was a lot of (good) furniture in the bedroom which made it feel cramped. Perhaps less would do. The wonderful welcome from Eleni, who was always happy to see us and help in any way she could. The location of the hotel is excellent, a short walk from the port and right by the bus station. The walk into town only takes minutes. Our room was small but this could be improved if some of the furniture was removed. Lovely to have a balcony looking out at the beautiful Aegean. Breakfast was varied,fruit, cereals, yogurt, rolls, toast and some cakes. It was available on 1st floor and taken to your room. A delight to have breakfast on the balcony in such a wonderful climate. Marina was an excellent host....always happy to see us and never missed a chance to engage with us. This all helps to make one feel welcome. Eleni on reception spoke excellent English so this made life very easy when we needed anything. She is a great receptionist. If you stay here do not miss eating at Taverna Kavourina. On leaving hotel turn left instead of right for town. It’s opposite the beach. Andreas and his son Yanis are excellent hosts and the food is good Greek fare. They are proud of what they do and it shows. Our room was spotless at hotel Togias and well serviced every day. No shortage of clean towels. We really enjoyed our stay here and would highly recommend it for. Holiday on the beautiful island of Aegina. No elevator in the hotel but an other hand the building is only two floored. The hotel is very well located, with an wonderful view towards the sea and other small islands but very practical as well. Our room was adapted for the needs of 3 adults, it was big enough and had 2 balconies. A big plus for the breakfast served on the balcony and for the kindness of the staff. We had ants in our room: in the bathroom and next to our bed too. Also the owner only accepted cash for paying the room.